Neptune which is overseeing the £70 million redevelopment of New Brighton, has submitted alternative plans for a new apartment block. Neptune’s original intention was to build Rococo Square, a block of 37 one and two bedroom apartments, sitting above ground floor retail/leisure space. This was originally intended to be part of the first phase along with the hugely successful Floral Pavilion Theater and Conference Centre. However, due to a downturn in market conditions, the residential element was put on hold. 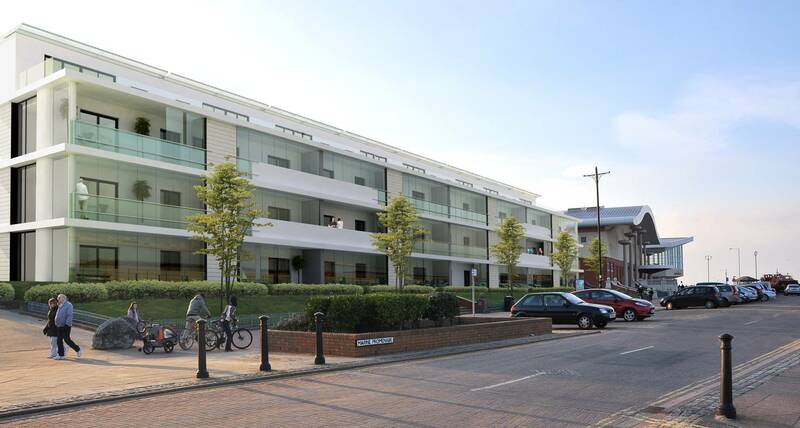 The new plans will see the number of apartments in the development at Victoria Gardens on Marine promenade in New Brighton reduced to 24 single aspect units. The unit sizes have increased to attract more owner-occupiers to the development, the largest apartment having 4 Bedrooms over 2 floors. The ground floor retail element of the scheme will no longer be included. The block will focus entirely on high quality residential accommodation. 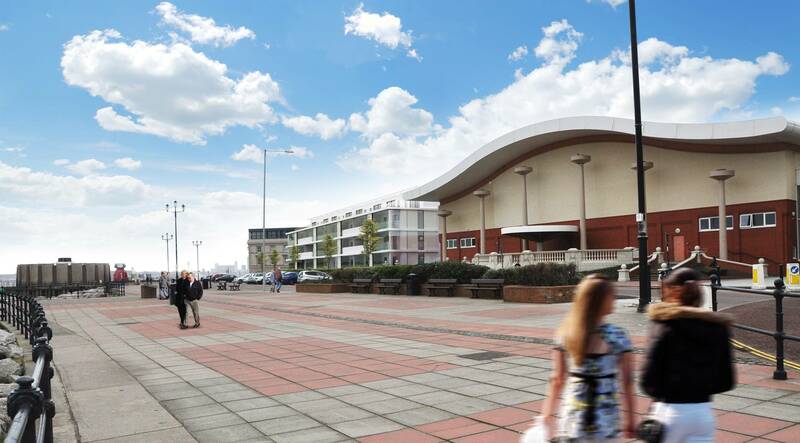 Neptune has submitted a planning application and if successful intends to start on site following completion of the Phase 2 of New Brighton’s regeneration. This includes a Morrison’s supermarket, a 6 screen digital cinema, a 66 bed Travelodge hotel and a number of cafes, restaurants and retail stores. “The new proposals will allow us to complete our regeneration plans for New Brighton, in a more timely manner than having to wait for the residential market to recover to a level that could enable us to deliver the old proposals”. 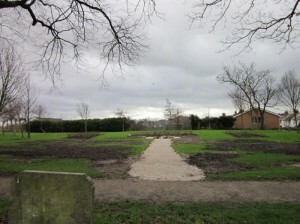 The next edition of the NEW BRIGHTON WALRUS will complete 14 years of this project. It is a considerable achievement for the local community members involved. The New Brighton Partnership would like to thank the 90+ people who give their time every March, May, September and December to deliver it out to 7,000 homes in New Brighton . Thanks also to all those who contribute news and information. We hope that you find it useful and informative. If you have any comments regarding the Walrus we would be interested to hear from you. Email rustyk92@sky.com or telephone 639 5798 and leave a message. We are always happy to find new people to deliver the Walrus. If you could spare half an hour four times a year to give us a hand please get in touch. The deadline for items of news for the May edition is Friday 15th April. The Magazines Conservation Society will be holding their Annual General meeting on Tuesday 29th March at 7.30pm at Vale House Cafe. Anyone who lives in the conservation Area is welcome to attend. Nominations for Committee members should be put in writing to the Secretary, Mrs Vicki Hall 38 Magazine Brow, Wallasey. CH45 1HP before Tuesday 22nd March. This term we have been thrilled to see the culmination of a project with the Wallasey photographic society and the crew of New Brighton Lifeboat Station. A talented group of our Year 6 writers have been working with their teacher, Mr John Jones, to develop their writing skills by interviewing members of our local lifeboat crew. 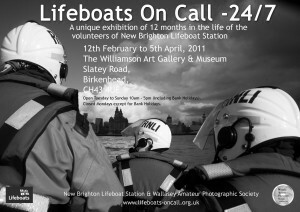 We were invited by Bob Warwick of the Wallasey Amateur Photographic Society to take part in the project to show a year in the life of the lifeboat team. The children began the project with a visit to school from Mark Harding, who is , like all members of this talented team, a volunteer who gives his time to help those in distress. 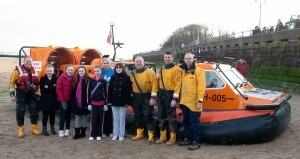 The children produced numerous pieces of writing for this project, all of which were inspired by the lives and work of our local lifeboat crew. The children were lucky enough to visit New Brighton lifeboat station and learn about the equipment used and what the crew do when on call. 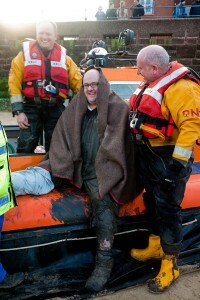 They also interviewed Mark Harding to find out about his involvement with the R.N.L.I and what it takes to be a Lifeboat volunteer. This visit and interview, along with some fantastic pictures taken by Wallasey Amateur Photographic society, provided writing opportunities for this talented group. Staff, from school,were delighted to attend the opening of the exhibition and were proud when a poem, written by Abigail Sefton, was read out. Councillor Alan Jennings, the Mayor of Wirral, who attended the opening ceremony, was so impressed with the quality of the children’s work that he extended an invitation to visit him in his chambers at Wallasey town hall. New Brighton Primary writing club are looking forward to this visit and to producing an article for the school magazine about their trip. They would also like to express their thanks to Bob Warwick and all at New Brighton lifeboat station for involving them in this project. A horrendous wave is such a killer. The gasping sailor send a cry. Come and join us for this special Easter season. and the Church is open for prayer. 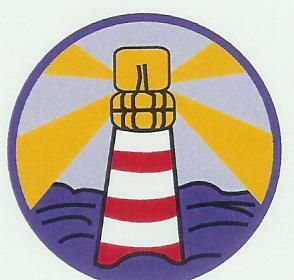 Emmanuel Church has thriving Girl Guides and Scouts for boys and girls, meeting weekly in the church hall. Please see the Leader in charge for new members. 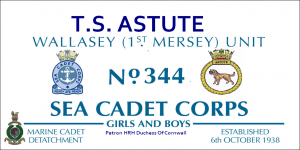 There is an urgent need for volunteers to help with the Scout section on Thursday evenings, please see Margaret or George. Where possible, try to prevent access to the more vulnerable, rear of your property. Spiked toppings, such as ‘Prikkastrip’, can legally be fitted to side and rear walls/fences, providing a small notice is displayed, warning people of the danger of injury if they attempt to climb the wall/fence. 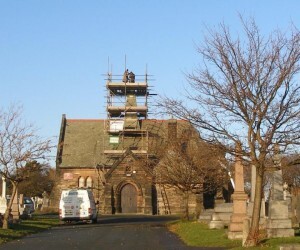 Anti-climb paint is another effective method of deterring offenders. Try to ensure your ‘wheelie’ bins are kept in the rear yard/garden. If you have any information regarding those persons responsible for committing these offences, you can ring the confidential, Crimestoppers line on 0800 555 111. At present, of the five companies that have signed up to Marine Point, we have met with The Light Cinema and will be meeting Travelodge within the next few weeks and will be starting the recruitment for both companies late March. We have contacted Cappuccinos and they will be starting their recruitment either June or July and we are waiting to here from Morrisons and Starbucks to discuss their recruitment requirements. The only company that has confirmed staff numbers required to date is Morrisons with approximately three hundred vacancies. As more companies sign up to the development we will be contacting them to offer our services. The vacancies for the companies that we are working with will be advertised through Wallasey Jobcentre Plus. Un-attached men and women over 50 and living in either New Brighton and Wallasey are asked to contact Richard Globe on 0151-639-6253, if they are both seriously interested and willing to form a much needed weekly friendship and social activities group but not a singles dating agency. Help is also required in getting this group off the ground, and finding a suitable weekly local venue with good transport facilities. Anyone who has some free time and would like to assist, please telephone Richard as soon as possible or email him at richardglobe0@gmail.com.